Fiberman provides Molded Fiberglass Grating to clients across Canada and the USA. Our experts know the FRP grating that is right for your application and are standing by and ready to help. Our super buying power means that you will always get the best price from Fiberman. We’re ready to answer your questions at 1.844.599.0260 or email us or send us a Quick Quote Request. We carry stock in all sheet sizes of molded fiberglass grating: 4’x8′, 4’x12′, and 3’x10′. Thicknesses: 1″, 1.5″ and 2″. We also ship container loads at special bulk pricing for contractors. Fiberglass molded grating is a strong mesh grating panel used as floor grates and trench grates that are corrosive and chemical resistant, for many industrial applications. Molded grating costs less than Pultruded Fiberglass Grating, and has limited structural capabilities. It is the simplest, easiest way to cover a trench for highly corrosive environments. 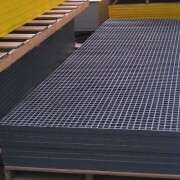 FRP Grating is cost-effective and allows for easy on-site cutting, to minimize cost and waste. Molded Fiberglass Grating from Fiberman is designed to last, with resin formulas optimized for UV resistance and durability in harsh environments, which means lower long-term maintenance costs. FRP Gratings are molded in one piece with load-bearing bars that continue in both directions, which means continuous side support is unnecessary. Molded FRP grating is available with a concave non-slip walking surface that is well-suited for trench grates. The large open surface area of molded grating means water does not build up on walking surfaces. For additional traction on walkways, grit top surfaces are available upon request. Fiberman Fiberglass Molded Grating weighs much less than steel grating, and is therefore easier to install. The high resin content of molded FRP grating provides excellent corrosion resistance, unlike steel which will rust and require continual repainting, cleaning or replacement. Molded FRP grating requires very little maintenance, even in the harsh chemical environments associated with acidic or alkali environments that are found in many industrial applications, marine environments and waste water treatment plants. A higher safety factor is achieved by designing in a higher glass content at the bottom of the grating for greater tensile strength. Not sure which type of grating is right for you? Have a look at our Grating Selection Chart. To find the fiberglass grating with the performance characteristics you need, please review our Fiberglass Grating Load Tables. Trench and Drain Grates are available in two resin systems which provide different levels of corrosion protection. Both resin systems meet Class 1 Flame Spread Rating per ASTM E-84 test standards. Polyester: A premium-grade isophthalic polyester resin system that provides excellent corrosion protection. Standard colors: Dark Gray, Light Gray, Yellow, and Green. Equivalent to Fiberglass Grating Competitor Brand and Strongwell Duragrate PP. Corr and Strongwell Duragrate VE. 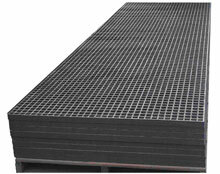 Common sheet sizes for molded FRP grating include: 4’x8′, 4’x12′, and 3’x10′. Common thicknesses include: 1″, 1.5″ and 2″. We hold stock on all sheet sizes and thicknesses in distribution centres across Canada and the USA. Call us for price and lead times. Molded Fiberglass Grating is excellent for use in heavy traffic areas, such as outdoor walkways on drilling platforms, in WWTP water treatment plants, in livestock facilities and anywhere you require secure and durable walking surfaces. Molded Fiberglass Grating comes with anti-slip surfaces as an important safety feature in walkways where moisture is present. Molded Fiberglass Grating has a large open area, and is not comfortable for bare feet. We recommend Pultruded Grating for any place that people will be walking in bare feet, such as waterparks or swimming pools. Discuss the specific needs of your project with one of Fiberman’s Molded Fiberglass Grating experts. We will ensure that the material you select will have the specifications required for safety and optimum performance. You will also benefit from our industry-leading quick quote turnaround and fast delivery across Canada and the US. For all Molded Fiberglass Grating inquiries, please call 1.844.599.0260 or email sales@fiberman.ca or Request a Quote. Fiberman’s headquarters in Western Canada stocks many Molded Fiberglass Grating dimensions, ready to ship across British Columbia, Alberta and all provinces in Canada. We have daily shipments from Vancouver to destinations including Edmonton, Calgary and Fort McMurray. For our US customers, we ship from distribution centers in: Pittsburgh, PA; Houston, TX; Knoxville, TN; Rochester, MN; Salt Lake City, Utah; and Orlando, FL. Fiberman’s pricing and service experts are standing by to help to find the best product for your project. With many varieties in stock and expedited shipping, we can supply your project with Molded Fiberglass Grating at the best possible price with fast delivery. In today’s connected world, we depend on cellular telephone signals, Wi-Fi networks and over the air radio and television signals. Wi-Fi and Bluetooth connectivity are essential to on-site work environments. Steel structures significantly disrupt these signals. Molded Fiberglass Grating is an essential part of building structures that are “electronically transparent” and do not interfere with radio frequency transmissions. Minimum order required to receive discount prices.